Help! I’m having a C Section, will I be able to breastfeed? Maitiú having his first breastfeed in the recovery room . I frequently get emails from mothers who are floored when faced with a change of direction in relation to their baby’s birth. Sometimes, they attend for a routine hospital appointment and are told they will be admitted for a C-Section in the next week. This decision can be taken for many reasons, such as if their baby is lying transverse or breech and is not suitable for a vaginal birth. I know that there are options to try to change positions etc. However, I am not a midwife, and so I’m going to stick to my area of expertise – breastfeeding, which can cause concern for mothers who are faced with the prospect of a C-Section. If your baby is born by LSCS (Lower Segment Caesarian Section – the medical term for it), yes you can breastfeed. In fact, you can breastfeed as soon as the baby is born. Let’s look at some tips that may help to make things easier for you when you are admitted for a routine C-Section. 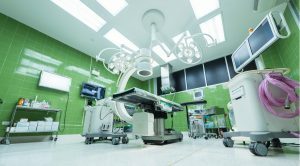 It can be a very surreal experience walking into the operating theatre and physically getting onto the operating table. Theatres are big open spaces with very bright lights. They are generally quiet and there’s not a lot of chatter. Everyone there has a role, knows what they’re doing and it’s easy to feel like a fish out of water, it can seem very scary. This is normal. Sometimes your birth partner may not be there beside you when the surgery starts. They are outside changing into scrubs! The midwife will bring him/her in and they will sit on a stool beside you. There are a few things you can do before the procedure gets underway to assist you as you start to breastfeed your new baby. Ask the anaesthetist to put the cardiac/heart electrodes on your back instead of on your chest. This is more comfortable when you do skin to skin with your brand-new baby. Similarly, ask for the IV cannula to be placed on your non-dominant hand as this will make holding the baby into your breast easier. One very experienced mother advises that it’s best to wear the gown back to front and to take your arm out of the sleeve before you lie down. What a great tip! Baby Lyla at 2 minutes young! There will be a midwife assigned to care for you during the process. Feel free to speak to her about your preferences for immediate skin to skin and breastfeeding as soon as the baby is ready. You can breastfeed quite fast after birth, even while you are being sutured. Babies need their first breastfeed within an hour after birth, but most will start to show hunger cues within 20 minutes of being born which lets you know it’s time to start. 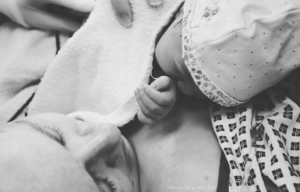 If, however, the midwife says that you are not allowed to have skin to skin contact with your baby or breastfeed at this time; don’t be afraid to ask why. You have a right to know what the reason for this is. If you are not satisfied with the answer, ask for the theatre manager and take up the discussion with them. Your obstetrician can also be on board, if you tell them your wishes before the section. My experience, through listening to mothers over the years, is that sometimes this turns into a negotiation. Remember that this is YOUR baby’s birth. You will reminisce and think about this for years. Your baby will grow into a child who will ask about their birth. It would be great to have happy memories to share with them and in the case of a planned, non emergency section for it to be as natural as possible. Your partner can be such a great advocate for you in this situation, as you will undoubtedly be feeling quite overwhelmed by the entire experience at this stage. Why not discuss your plans around this in advance and agree that they will take over negotiations if the situation is proving difficult to resolve? It may happen that you feel nauseated and unwell after the drugs and the pulling sensation inside your tummy, it is common. If this does happen, don’t worry, your partner can do skin to skin contact with your baby until you are ready. The main breastfeeding holds that seem to work better post C-Section are football, laidback and sidelying. Some mothers swear by a breastfeeding cushion while others prefer lots of squishy pillows or cushions strategically placed under their elbow and on their lap to protect the section wound. Experiment and see what works best for you. 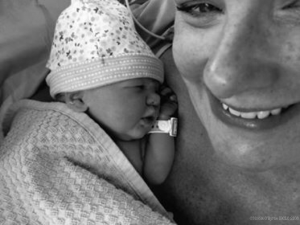 Freya at 3 minutes old…her beaming mum Susan was thrilled to be able to do immediate skin to skin during her c section at the Coombe Hospital in Dublin 8. This brings us onto the subject of keeping your baby with you when you move to the recovery area after the operating room. In the recovery area the midwives will monitor your blood pressure, heart rate and watch for bleeding etc. New mothers are kept there for between 20 minutes to 2-3 hours depending on how stable they are. I sometimes still hear about mothers being separated from their babies in recovery. The baby’s Dad or mother’s partner is left with the baby outside. The reason for this can be that if the recovery room has a mother who has had a miscarriage or whose baby has died in utero, the staff will prioritise the emotional needs of that family. This is not really an ideal situation, it is hard for you to be separated from your new baby so soon after giving birth. Recovery rooms need to accommodate all patients needs at this emotional time. Although most recovery rooms are now able to accommodate everyone’s wishes, I am still hearing stories of babies being separated from their mother at this point. This really needs to change. Some mothers say to me “maybe I didn’t try hard enough” and my heart breaks a little for them. When you have had a C-Section, your milk maybe delayed coming in by 12 -24 hours. Due to the operation, it can be more difficult for you to move around afterwards. One mother suggested moving the bedside locker nearer so that you can reach the nappies more easily. Although you have this added difficulty, you are likely to get more help and support after a C-Section. Your hospital stay will be extended and this means you might be still there when your milk comes in (Day 3-5). This can be invaluable for getting assistance with breastfeeding issues that occur at this stage. Having a C-Section is not ideal, but it doesn’t mean that you won’t be able to breastfeed. If you would like to learn more about what to expect during the early weeks of breastfeeding, I hold a breastfeeding prep class on a monthly basis in the Beacon Hotel in Sandyford. Parents-to-be love this interactive class! They are more confident about breastfeeding, they know where to get help and understand that breastfeeding is a learned art. Remember it does take time to establish but it is so worth it! Note: For the purposes of this blog we are talking about a planned C-Section rather than an emergency one. In an emergency, time is of the essence and it’s generally done at warp speed by the obstetrician. Here is a video on gentle sections, skin to skin and breastfeeding.